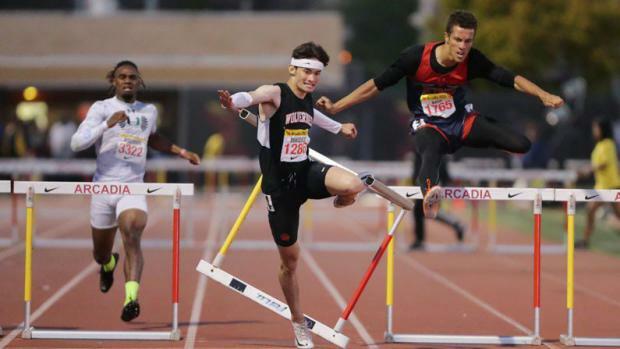 Arcadia was a wonderful showcase for CA's best hurdlers. We saw Stockton St. Mary's junior Jamar Marshall win the invitational 110 hurdles and the seeded 300 hurdles. We got to see Bakersfield Liberty sophomore Reese Renz in both distances, including a breakout winning performance in the seeded 300s. We got to see Silver Creek senior Jazlynn Shearer dazzle in the 100s before heading back to the horizontal jump pits. We got to see Merrill West senior Warren Williams, Calabasas sophomore Bella Witt and Las Lomas senior Taylor Weidinger, all compete against stellar fields. We got a dose of Long Beach Wilson junior Rachel Glenn over the barriers -- when not running a curve -- and Calabasas senior Kyla Robinson-Hubbard, Long Beach Poly senior Kenya Payne, and Norco junior Taylor Shorter. We got to witness a NASCAR-like finish of the boys invitational 300 hurdles, a scrum that included CA stars Brayden Borquez of Harvard Westlake, LA Cathedral sophomore Anthony Taylor, Upland senior Caleb Lutalo Roberson and Riverside King senior Reyte Rash. The latter two went 1-2 in the 300s at the State Final last June. That's just a list of CA's finest stars of the event, names you will undoubtedly read more about as the season plays out over this final two exciting months. And how many names didn't we mention? While we preface this article with a bit of who's-who, not all of those names will appear below because this is a report about combined hurdlers. Those who specialize at one or the other without a mark in both, didn't make this list. This article ranks the state's best hurdlers by combined time. For boys, the ranking is based on their combined times in the 110- and 300-meter hurdles. For girls, it's the 100- and 300-meter hurdles. Times are based on the hurdler's best performance in 2019 and that mark needed to be in our database by Monday, April 6 at 2 p.m. Marks that were delayed in processing may not have been included in this report. Our process was to request the top 500 hurdles at both distances. The system eliminated athletes without times in both events. For boys, the list goes 418 deep. For girls, it's 395 deep. Note that the first data point is the 110/100s, so only athletes among the top 500 in the state in the shorter of the two races who also have a 300 time will appear here. A top-500 athlete in the 300 hurdles who is not among the top 500 in the shorter race did not make the list. The database can produce some really cool reports and programers are working to improve it all the time, but for now, this search restricts us to those among the first data point. We hope that helps you better understand this process.